Darwin vs. God: The problem with dichotomy | Grand Central Magazine | Your Campus. Your Story. If you’re Christian you hate Charles Darwin and believing in evolution means you are an Atheist. The common assumption that all religious people, especially Christians, must denounce the theories of Charles Darwin to remain true to their religious beliefs was challenged by Dr. Denis Lameoureux, a doctor of dentistry, theology and biology on Nov. 11 in the Plachta Auditorium. With religion in particular, a dichotomy has developed where people believe they must choose between supporting creationism or the theory of evolution, but not both, Lameoureux said. He said people do not have to choose. “There’s more than simply two positions,” Lamoureux said. 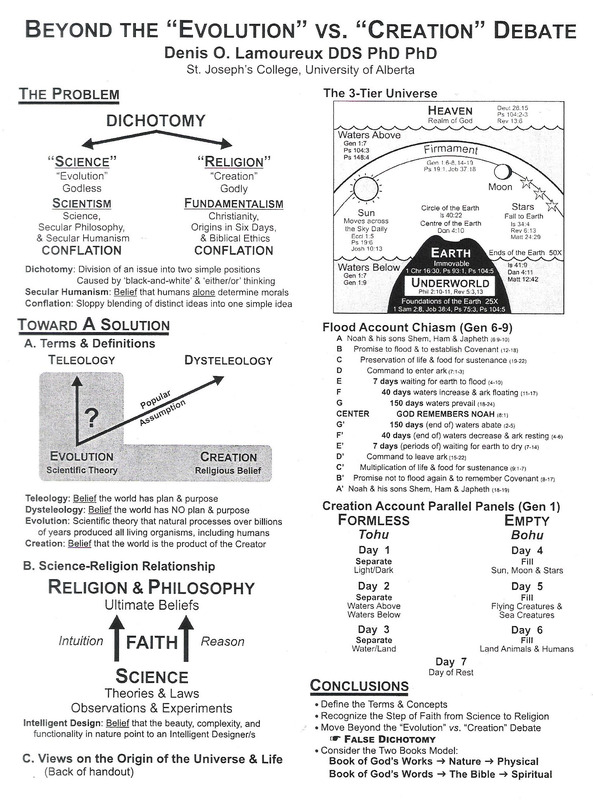 The chart consisted of five major but not exclusive groupings, that he believes most people fall under in making their beliefs in science and religion work together. 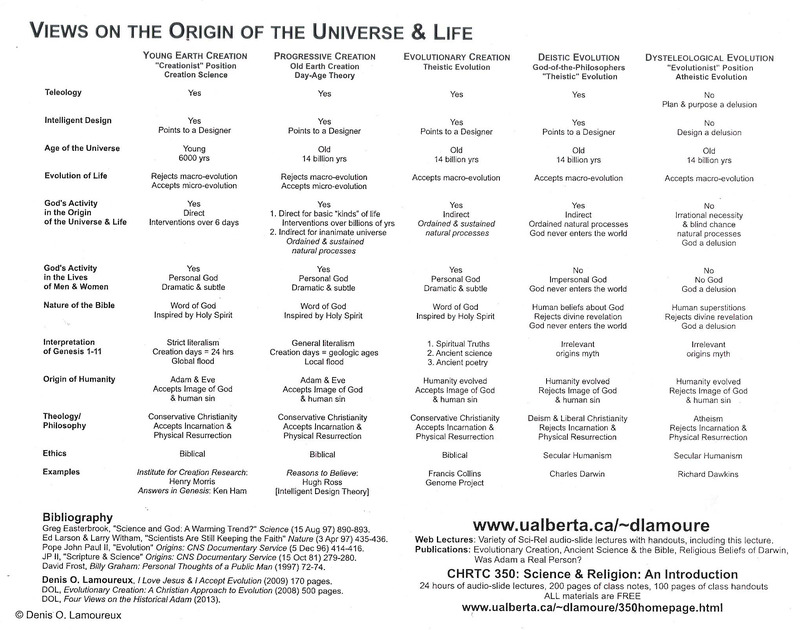 These options include beliefs in Young Earth Creation, Progressive Creation, Evolutionary Creation, Deistic Evolution, and Dysteleological Evolution. Young Earth Creation encompasses the beliefs that the earth is only about 6,000 years old and the interpretation of Genesis is to be literal. Dysteleological Evolution, emits the belief that there is absolutely no intellectual design of the universe, that the earth is 14 billion years old and that the story in Genesis as a myth. Though these two groups are on the forefront of the religion vs. science battle, Lamoureux said most people believe in a mixture of the two and that it is acceptable to believe in both simultaneously. He said there is no right or wrong but to many there appears to be only two choices when in reality there are more. The internal struggle to decide which conviction to choose is commonly first experienced in college. College is a pivotal time for young adults to become independent. It is a time of self discovery and growth. New people and new ideas are introduced and a whirlwind of revelations arise. Often the principles of childhood belief systems are questioned, and college students believe they must choose between what their parents believe and what their friends do. Lamoureux had fluctuating beliefs after college when his life was bouncing back and forth, with no sight of middle ground. Being raised Christian in his Canadian home, he stopped going to church when he started college and told his parents that after learning about and accepting the evidence of evolution, he could no longer be Christian. He went back to college to be a Creation Scientist but in his research found only facts and discoveries that further supported Darwin’s theory. “I have yet to find any evidence to disprove the theory of evolution; a theory that should be easy to disprove,” he said. It was at that point that Lamoureux realized that there was a problem in the “either or” and the black-and-white thinking that has plagued religious and science worlds for decades. Lamoureux now works at St. Joseph’s College and strives to help his students find a middle ground with their own beliefs on science and religion. “Let everyone endlessly improve their understanding of both,” he said. Separator image Posted in Campus, College Life, Community, Events, Students and tagged with Campus Life, Creation, Dichotomy, Evolution, Lamoureux, Plachta Auditorium, religion, Sascha Seide, Science.